Hey you! 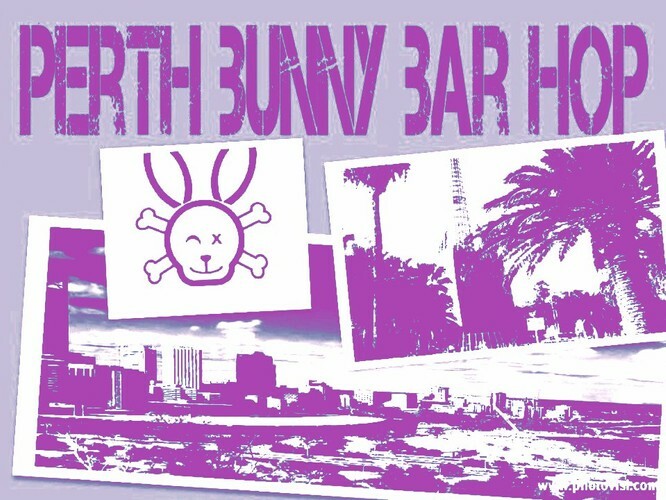 You are cordially invited to participate in the totally epic 1st Annual Perth Bunny Barhop! What: A good ol'-fashioned barhop in bunny ears. We will move together as a boisterous band of boozed-up bunnies, hopping from bar to bar to bar to bar to bar, grabbing a drink at each spot, giving out high fives, and just generally sticking it to the Man. Love: We welcome rabbits of all cliques, circles and crews. Throw on your ears, come on down, and make a mass of instant new drunken friends! At this point we'll see how every bunny feels about a Northbridge invasion and perhaps hop down William Street and Bunny Parade it over the Horseshoe Bridge ...Brass Monkey? Lets see how the night unravels for us rabbits! - We want everyBunny to be Respectful and Responsible! We recommend Rabbits use public transport, taxis or have a designated driver. - Rabbit ears mandatory. Seriously. Fashion them out of construction paper. Grab them from the Easter aisle of your friendly neighborhood shop, maim a stuffed animal. Just wear the frickin' ears! Where can you get your ears? They've been spotted at Spotlight for $5 a pair, and the Easter aisle at Coles and Woolies for around the same price. Also try the Reject Shop and Red Dot stores, $2-$3 a pair or be a crafty rabbit and make your own, costumes welcomed. Don't be afraid to go all out!